I’m a very lucky girl. After reading my last review, my friend was kind enough to purchase the beer on my must try list – Bell’s HopSlam Ale. This beer is no joke. And at $15 for a six pack, it better deliver. “A biting, bitter, tongue bruiser of an ale. 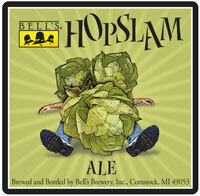 With a name like Hopslam, what did you expect?” – Bell’s website. I have to be honest regarding the hype surrounding this ale. Although it did not disappoint me in the least, it did not meet my expectations. I really enjoyed the ale and would never turn it down if it was offered to me, but it is hard to justify purchasing it at such a high cost. If I ever found it on tap, however, I would definitely order it. Now onto the beer review. The Hopslam is considered a Double IPA (DIPA), also known as an Imperial IPA. DIPAs are IPA’s with higher levels of hops and malts, typically having an ABV of 7% or higher. The style of beer is very new, circa mi-90’s, mostly being associated with the West Coast. It is the most popular style with hopheads and my personal favorite. Bell’s Hopslam Ale poured a beautiful golden copper. The ale was cloudy, having fairly low clarity. The head was thin, dissolving very quickly. The aroma was definitely dominated by the hops, which were complimented with hints of grapefruit. The bold flavor of the ale was impressive. The hops “slammed” my taste-buds with bitter goodness and the grapefruit added a nice crisp edge. There was a distinctive “tree” flavor, that I later identified as pine. The beer was not as bitter as I was expecting it to be, which is my only complaint. The substantially high level of alcohol, 10% ABV, took away a portion of the bitterness. The sweetness of the malt and honey also balanced out the bitterness. All in all, it was a pretty damn tasty brew. Neither the alcohol, hops, nor malt out-dominated the others, allowing the ale to have a great balance. I’m a huge fan of Bell’s, and the Hopslam Ale definitely increased my confidence in the brewery. I’m planning on making a visit to Bell’s sometime this year. I would almost go as far as saying I liked it more than the Dogfish Head 90 minute IPA. Although, would probably have to enjoy both side by side to verify this claim. Usually, I prefer the 60 minute IPA to the 90 minute IPA. I’d probably pick Bell’s Two-Hearted, one of my staples, over the Hopslam. Both the 60 minute IPA and Two-Hearted are lower in alcohol, which in my opinion allows the hops flavor to come through stronger. As far as Double IPAs go, Stone Ruination IPA is still my favorite tasted thus far. Moral of the story? I love my hops and Double IPAs. Bell’s does a great job with Hopslam. If you are willing to shell out the dough, I definitely suggest trying it out. Bell’s Brewery, Inc. formerly Kalamazoo Brewing Company, founded by Larry Bell as a home-brewing supply shop in 1983, sold its first beer in 1985. Originally brewing in a 15-gallon soup kettle, the company has grown remarkably from its production of 135 barrels (1 bbl = 31 gal.) in 1986 to over 90,000 barrels in 2007. Bell’s Brewery has grown from a tiny operation renting part of a former plumbing supply warehouse to a bustling, regional craft brewery. Over twenty years of brewing, Bell’s Brewery has built a nationwide reputation as a creative and talented brewery, playing a significant role in changing the beerscape of the nation.